Hyundai Motor India Limited (HMIL) debuted its all new generation of the Verna C-segment sedan for domestic customers in August 2017. In its over a year of presence, the latest Verna has been able to better its main rivals Honda City and Maruti Suzuki Ciaz in many occasions in monthly sales charts. 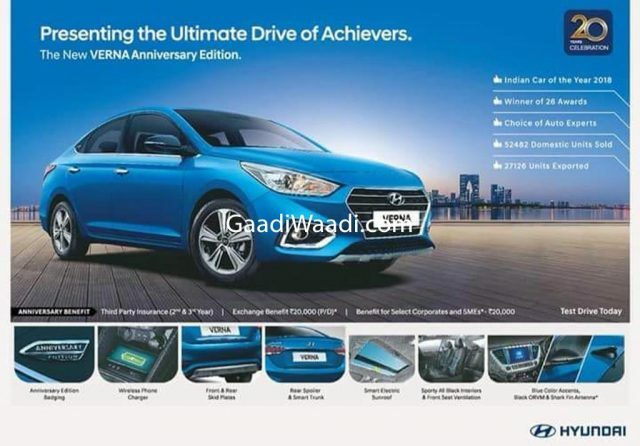 With average monthly sales of around 4,000 units since the fifth generation Verna came into the fore, Hyundai wants to make the most out of it and is celebrating one year in the market with an Anniversary Edition ahead of the festive season when buying sentiments will be typically high. Hyundai says over 52,400 units of the latest Verna have been sold across the country and 27,126 examples were exported to international markets. To make the Verna Anniversary Edition attractive, the South Korean auto major has announced a number of benefits including 2nd and 3rd year third party insurance, additional exchange benefit of Rs. 20,000 and select corporate benefit of Rs. 20,000. 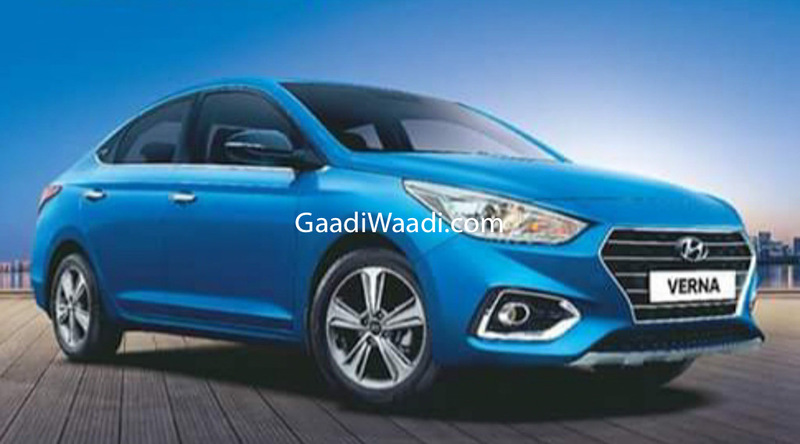 As part of the package, the Verna comes painted with a new Marina Blue colour, which is already available in Elite i20 and bigger Elantra sibling. The sedan based on K2 platform also gains Anniversary badging, skid plates at front and rear and wireless phone charging facility. Other main highlights are an all-black interior theme, blue accents inside the cabin, black coloured wing mirrors and shark fin antenna, smart trunk, electric sunroof, front seat ventilation, chrome garnished fog lamps, and boot integrated spoiler. Currently priced between Rs. 7.86 lakh and Rs. 12.98 lakh (ex-showroom), the Hyundai Verna Anniversary Edition is based on the SX grade of petrol and diesel models and comes priced at around Rs. 20,000-25,000 in addition compared to the regular variants. No mechanical changes have been implemented as the Verna continues to use the same 1.6-litre petrol and diesel engines. The petrol four-pot unit makes 121 bhp at 6,400 rpm and 151 Nm of peak torque delivered at 4,850 rpm. Meanwhile, the diesel engine kicks out an impressive 126 bhp at 4,000 rpm and 260 Nm from as low as 1,500 rpm. Both the powertrains are connected to either a six-speed manual or a six-speed automatic transmission.